This fabulous party just caught my eye. It’s by Kami Buchanan over at Kami Buchanan Custom Designs. 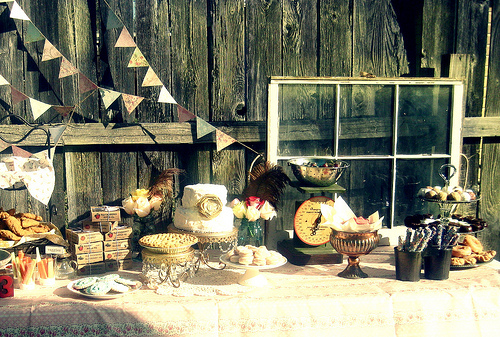 Kami threw her daughter Emmy a vintage party. What a fantastic and unique theme! She must be a very stylish little girl. Kami has a terrific attention to detail. I love the sweets bar with all the vintage touches, the intimate sitting areas and the simple but tasty-looking menu. I think a photo booth with props is always such a fun thing to do at parties and it looks like Emmy’s friends and family really rocked it! Click on over to Kami Buchanan Custom Designs to see more of this sweet vintage masterpiece. I can’t wait to see more parties from Kami! Party On!